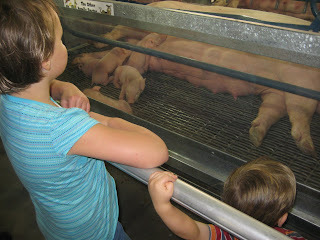 We ventured to the Great Minnesota Get-Together yesterday for some end-of-summer fun. 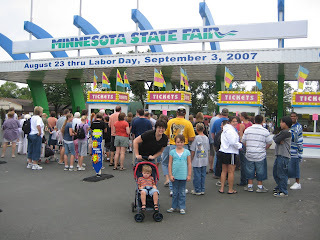 I love the Minnesota State Fair as much as the next guy, but having seen it only through kids' eyes (and their tired legs), you'll have to pardon my non-native cynicism over the event. 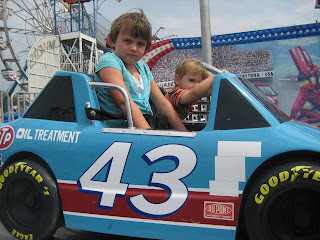 Rushing, as we were, because Big can only last so long, it felt like a short-hurdle-sprint from one high fructose food item to another high fat food item interspersed with rickety kids rides. After just having had Tiny Tim's Donuts, for example, Seven's eyes happened upon a Cotton Candy stand, which was follwed by the predictable refrain "Can I have some ______?" Insert here, "cotton candy." stuffed-animal-valued at-approximately-$0.10 (My cynicism is actually too heavy handed here. This is a blast) when Seven came across a five-dollar-bill on the ground. We spent a bit of time looking around the crowd to see if anyone had possibly known that they had dropped anything before claiming the cash for our own and explaining the concept of 'dumb luck' to Seven. On to more of the beg/spend/eat cycle. On the walk out, sweaty and exhausted, Seven strolled a few paces behind, sad to see the day and, effectively, her summer, end as she starts SECOND grade tomorrow. At one point she saw a man on the corner asking for money--a man that BioMom and I had not even really noticed. Without hesitation, she dropped her five into his little cup. Her lack of attachment to things is saintlike and, well, refreshing. In response to asking her motivations around the gift she said, He needed it more than I did. Go Seven! I'm glad you guys had a good end to the summer. 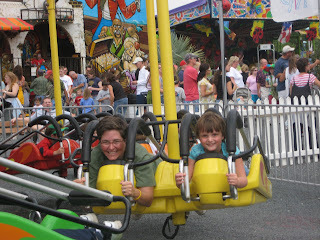 We skipped the fair this year but now I feel like I just lived it through you! I love it for the kids but it is a bit too much for me.